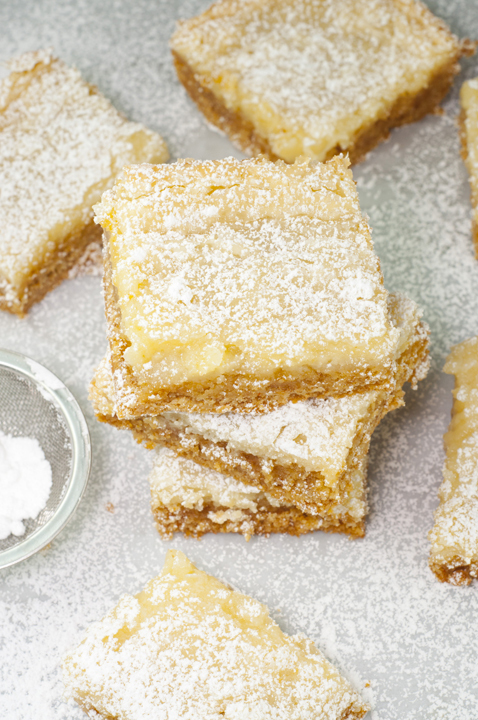 Ooey Gooey Butter Cake Bars, also known as "Chess Squares" or "Chess Cake Bars" are easy, rich, and truly addictive! Combine the cake mix, 1 egg and 8 tablespoons butter and mix well with an electric mixer. Pat the mixture into the bottom of a lightly greased 13 by 9-inch baking pan. In a large bowl, beat the cream cheese until smooth. Beat the remaining two eggs. Add the remaining 2 eggs, vanilla and remaining 8 tablespoons butter and beat together. Next, add the powdered sugar and mix well until all is incorporated. Spread this over cake batter and bake for 40 to 50 minutes. Make sure not to over bake as the center should be a little bit gooey, but not so gooey that they completely fall apart. Dust with a little extra powdered sugar before serving. Let cool completely before cutting into. Enjoy!